*Plus tax, license, title and fees. Financing is available on approved credit. Contact us for details. Spring has arrived and it is time to start thinking about another camping season. Soon you will need to get your camper ready for summer. We have summerization specials available here. Or take a look at our Service Department Page for more information. There's no place like home. That special feeling of going to sleep in your own bed. Preparing meals and eating in your own kitchen. Having your very own living room to relax in. But you can't spend all of your time there. It's nice to get away and see the country. Maybe for a long vacation, or maybe just for a short weekend. With a camper or RV from Gag's Camper Way, you can take that feeling of being home with you. That's why we say: "You're Home on Vacation." With your very own camper or RV you will have all those conveniences and the comfort of your very own home, yet you'll be on vacation. Be a tourist all day and still fall asleep in your own bed. Spend the day visiting with friends and acquaintances in a new place and still retire to your own kitchen and living room for a private evening. You'll find your next trip much more carefree and relaxing when you know "You're Home on Vacation." We offer sales and service for new and used campers and RVs. We sell Jayco and K-Z brand travel trailers and fifth wheels. From a light weight Sportsmen Classic, to a luxurious Jayco North Point, we have the camper or RV for you. Stop out and see us today. CONGRATULATIONS TO JAYCO AND K-Z! The RVDA Dealer Satisfaction Index Award results are in and once again Jayco and K-Z are winners. The Jayco brands that won include our great line up of Jay Feather, Jay Flight and Eagle travel trailers and fifth wheels. The K-Z brands that won include our great line up of Sportsmen, Sportsmen Classic, Spree and Spree Escape travel trailers. We are very proud to be able to offer such a great selection of campers to our customers. The dedication and commitment made by both Jayco and K-Z really are valuable to us and to our customers. We offer valuable camping advice, tips and news about upcoming sales and events. Learn more about Gag's Camper Way and keep up to date with information and upcoming sales and events. We have a great selection of new Travel Trailers, Fifth Wheels and Ice Houses from Jayco, K-Z and Glacier. Jayco has been building campers and RVs since 1968. For more than 40 years, Jayco has helped generation after generation create new family memories every day. We'd love nothing more than to be part of your family story. 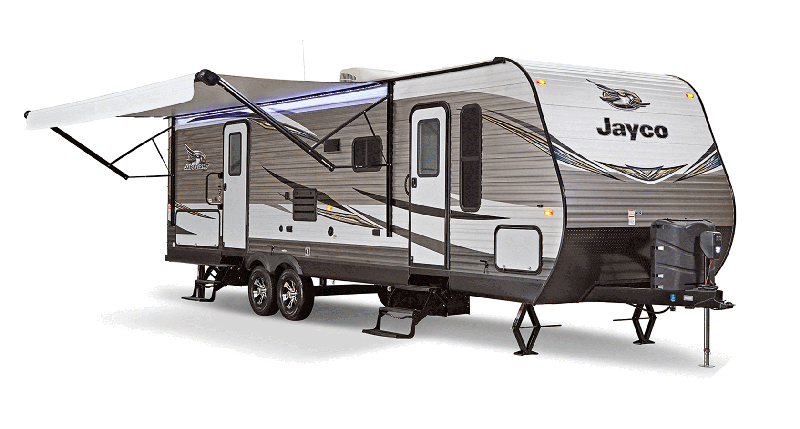 Jayco brands we carry include: Jay Feather Travel Trailers, Hummingbird Travel Trailers, White Hawk Travel Trailers, Jay Flight Travel Trailers, Eagle Travel Trailers and Fifth Wheels, North Point Fifth Wheels, Octane Toy Hauler Travel Trailers and Talon Toy Hauler Fifth Wheels. K-Z has been manufacturing quality built Sportsmen campers since 1972. The K-Z family tree may have come from small seeds of humble beginnings, but core values and hard work grew them into the thriving company they are today. Still privately owned, K-Z enjoys the loyalty of employees, dealers, and retail customers alike, who have all joined the K-Z family tree. K-Z brands we carry include: Sportsmen Travel Trailer and Fifth Wheels; Sportsmen Classic, Sportsmen LE, Connect, Connect Lite, Escape, Escape Mini Travel Trailers; and Sportster Travel Trailer and Fifth Wheel Toy Haulers. Glacier builds only the highest quality ice fising shelters, constructed of premium materials that will provide lasting value and years of trouble-free service. See for yourself how Glacier's attention to detail and never-ending commitment to product improvement sets Glacier Ice House apart from the compteition and makes a Glacier Ice House "The Ultimate Way to Play!" Glacier brands we carry include: Explorer, Ice House and Toy Haulers. We've known for years the people who get out and use their campers have a more active lifestyle. And no matter how it is used, your camper will help you enjoy the outdoors more. Now, a study finds that RVers live healthier than their non-RVing counterparts. Healthy campers. RVers are determined to go camping and not let fuel costs dampen their vacation plans. Campgrounds and RV parks are finding that RVers are keeping gas expenses low by staying at local parks rather that traveling out of state. Read More. Vacationing in an RV or Camper is better for the environment because vacationers leave a smaller carbon footprint in a camper. Read more. Campers save money compared to other forms of travel. A study shows that traveling in a camper is still less expensive than other forms of travel. Read more.